A two hour drive from Cape Town in the Walker Bay / Stanford area, the Fynbos Trail is walked over three days, covering a total distance of 25km. Two nights are spent on the trail in comfortable farmhouse style accommodation at Fynbos Retreat and self-catering cottages at Bodhi Khaya. Overall the walking is easy, although a good level of hiking fitness will make the trek a more comfortable and enjoyable experience. There are a few short climbs out of the valley, with the paths following a reasonable grading up and down the hills. There is no exposure to heights nor scrambling required. The paths are mainly well defined and maintained, although surfaces are often natural. We recommended hiking boots, especially in winter, when you may encounter patches of mud and wet areas. The trail is offered as a ‘slackpacking’ experience with all overnight luggage and food requirements transported. It can be done on a fully guided and catered basis; or as a self-catered, self-guided experience. We highly recommend the guided experience. The Fynbos Trail is a linear trek, with secure parking available at the start, at the Growing the Future Project. All hikers will be transported from the finish at Grootbos Private Nature Reserve, back to the cars. There are so many beautiful and interesting hiking routes in the Western Cape these days that finding a new one that exceeds expectations is always exciting. 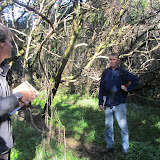 The new Fynbos Trail in the Walker Bay Fynbos Conservancy area is one such trail. I was lucky enough to be able to do it on a beautiful Western Cape winters weekend in July. So much for the reputation of the Cape being a wet and wild place to walk in winter. The conditions could not have been better. Added to the experience was the advantage of the trail hosted by husband and wife team of Sean & Michele Privett. Sean is a botanist and together with Walker Bay guide Billy Robertson, added a whole dimension to the interest and enjoyment. We got together for the start, at the innovative Growing the Future project on the Grootbos Estate. This project has been set up to train groups of women in sustainable farming methods and other associated life skills. The fruit and vegetables grown on the project are used in the kitchens of the guest lodges of the Grootbos Private Nature Reserve as well as on the catered version of the trail. I was part of a group that was being introduced to the Green Flag trail assessment system, so our schedule was slightly different to the usual. The normal 2 p.m. start gives plenty of time for a leisurely drive from Cape Town and lunch in Hermanus or closer by in Stanford. An important aspect of Slackpacking is being able to enjoy a beer (or whatever your preference is) after a hard days walking, so I stopped off at the Birckenhead Brewery in Stanford, on my way, to pick up some local beer. Sean and Billy met us at the start for pre-trail briefing, paperwork and organisation of luggage transport. Our Green Flag mission, meant that we had a slightly later start than would otherwise have been the case, but we soon set off to trek through high stands of strandveld fynbos and in to the wonderful old milkwood forest of Steynsbos – one of only eight similar forests in the world. This is a beautiful and peaceful place with paths meandering around twisted tree trunks and overhanging branches. Although these trees are not tall, the knurled branches give them an air of being wise and distinguished. On leaving the forest the trail undulates through magnificent stands of Fynbos, up and down the hills, into a valley where it joins an old jeep track. At the end of the track there is a dam where, in summer, is an ideal rest stop and swimming site. It was a bit cool for that in July. As we hiked up towards Pinnacle View Point – the highest point on day 1 – Sean added interest, explaining how the silver-edge pincushion protea ( Leucospermum patersonii ) acts as a landing pad for sugarbird, getting the pollen on its head as it extracts the nectar and how the seed drops to the ground for the ants to carry underground to exactly the right depth, before they eat away the outer coating and leave the seed until the conditions are exactly right for propagation. He also pointed out the Erica irregularis, flowering in abundance on the hillside, but endemic to the area, occurring only between Stanford and De Kelders and nowhere else in the world. The views from the high point of Pinnacle View Point are spectacular, with mountains in the distance in the one side and the sea, with the outline of the Cape Peninsula in the distance on the other. By the end of the trail there was a danger that spectacular views would become routine. The sun was sinking below the hills at this stage as the late start caught up with us. Reluctantly we opted for a short cut along a jeep track that took us down to Fynbos Retreat, our overnight accommodation. The excuse was that we would be back to try out the usual path at some stage in the future. Fynbos Retreat is comfortable farmhouse accommodation, with crisp white linen on the beds, a blazing hearth in the lounge and a large farmhouse kitchen. The garden setting is stunning and there is a dam close-by for swimming. Electricity is by generator, which Billy had rushed ahead to get started, apparently nearly decapitating himself in the process, and there is a built in pizza oven on the veranda. Billy proved to be a master pizza maker, with home recipe, freshly made bases and a variety of fillings that we were able mix and match for ourselves. The beers were welcome and later Sean treated us to a tasting of his own home made, very drinkable Merlot, while telling us the amusing story of its development. The company and conversation was excellent as we tucked in to the pizzas around the fire in the lounge. After a nice warm shower, it did not take much effort to get to sleep that night. The second day started with the arrival of Michele with a huge breakfast display. Fruit, fruit juices, a range of cereals, eggs, tomato, toast, preserves and of course, coffee. Clearly it is not a trail that is designed for weight loss – but that is ‘slackpacking’. Getting the pack back on was a bit of a struggle, but we soon set off along the path that ran along the side of the hill above the Witvoetskloof Valley. Proteas, ericas, restios and a huge variety of other flora line the path and the hills either side, as it descends into the valley itself. There is a boardwalk bridge and steps leading steeply down to the floor of the valley, past a fast running waterfall. As there had been quite a bit of rain prior to us doing the trail, it had to be negotiated with care to avoid slipping. A bit like the milkwood forest of the day before, it is a beautifully peaceful place, with the addition of the gurgle of the stream from time to time, a number of small waterfalls, twisted tree trunks and moss covered rocks. We stopped for coffee and delicious homemade crunchie biscuits before starting our trek out of the valley. The highpoint of this day is Grootberg and as we hiked up this path, Billy and Sean pointed out the differences between the Fynbos on the limestone ridges and the sandstone slopes. The top of the Grootberg gives a 360 degree views over the entire valley and across to sea at Gansbaai and De Kelders, Hermanus and Cape Point – wow. The slopes of the hill on the other side of Grootberg were swept by fire in April and are fairly exposed, with a few fire heath ( Erica cerinthoides ) and tufts of green poking through among the blackened skeletons of the burned protea bushes. Down in the valley below the path has been completed wiped out by the fire, mainly because of the speed with which the new growth of groundcover has sprung up. On our way to the lunch spot at the Stinkhoutsbos forest we had to a bit of ‘bundu bashing’ to get to where the path was visible once more. Michele was waiting for us with a welcome array of mouth watering quiches, pate, cheeses, breads, fruit, juices and more, in a beautiful shaded spot among the afromontane trees. The area was badly exploited for the hard wood trees growing there during the Second World War and made vulnerable to fires as a result. Considerable effort is being made to protect and re-establish the forest by the Conservancy and every hiker participating in the trail is given a tree to plant, gradually reclaiming the forest. It felt good finding a suitable spot and digging the hole to plant my White Pear ( Apodytes dimidiate ) in to the ground. After lunch we headed along a clear path to Flower Valley Farm, where local flowers are grown, cut and exported for the international cut flower market. It is a project wherein there is a good deal of participation and development with the local population, creating employment and training opportunities. After passing the farm the path disappeared once again, swallowed up by fire and new growth. With a bit of local knowledge, Sean found the way to the jeep track and we were on our way once more. It was Super 15 rugby semi-final day and Sean had invited us to watch the match at his home, so once again it was a short cut, missing the section of path leading to Bodhi Khaya, where we would be spending the night. Luckily the braai provided by Sean and Michele made up by far, for the disappointing rugby result (being an ardent Stormers fan – enough said). This trail lends itself well to good companionship and conversation and the rugby was soon forgotten. Another wonderful evening to end a very satisfying day. Transport was arranged to take us to the very comfortable Bodhi Khaya self-catering cottages. After another hearty breakfast, we set out on the last leg of the trail, starting with a walk up the side of the hill above Bodhi Khaya. The setting for this tranquil retreat is superb and it is no surprise that it is a place where people come to relax, meditate and get in touch with nature. The Fynbos, dominated at one stage by bright orange pincushion proteas on either side of the path, presents an impenetrable tangle that would be impossible to get through without the cut path. The trail links with various paths used by residents from Bodhi Khaya, crossing a stream at one point where, lagging behind the rest of the group to take photographs, I managed to slip, nearly landing in the stream. Fortunately some soft grass on the other side provided a soft landing and I was able to protect the camera. Eventually route leads into the Baviaansfontein Valley, following a seemingly disused jeep track to Grootbos Private Nature Reserve. This is easy walking between the hills that narrow up ahead as the slopes become steeper. At this point the paths winds gradually up through the forest overlooking the deep gorge, to the plateau above. Suddenly we are looking down a gradual slope, over stands of purple Erica, towards De Kelders and the sea in the distance. The path, on a now overgrown wagon track, is long and straight, with constant contrast between the bright blue of the sea and the pale blue of the sky standing out against the green and purple of the hills. We are in to the last leg of the trail now as the track descends a short distance in to the Grootbos milkwood forest, where we stopped for a short tea break before the short stretch to Grootbos itself. Like the Steynbos forest, this one is a magical place, although a little more open, making one more aware that it is surrounded by Fynbos. About half way through the forest I suddenly became aware of a load buzzing around me and found myself in surrounded by bees. Fortunately Anne, in front of me remained calm and walked on without panicking, helping me to keep my own head. I ended up with a few stings on my arms and eyebrow but no major damage as the swarm moved on. The Grootbos building emerged from the forest, blending in so well that you only become aware of them as you pass. Then on to the magnificent cultivated garden of the estate and the tantalising smells coming from the restaurant. At that stage we settled for a cold beer perched on the luxury recliners around the pool, later being tempted to try some of the lunch buffet. (Lunch at the restaurant is an optional extra at the end of the hike). Transport was laid on to take us back to our cars at Growing the Future, and with reluctant goodbyes we gathered our belongings for a return to Cape Town. Needless to say, a few of us were tempted to stop off for a beer ‘tasting’ at the Birckenhead. The Fynbos Trail is a wonderful and highly recommended experience in growing Slackpacker tradition. We will surely be putting a group together soon to experience what is likely to become one of the classic Western Cape trekking routes.